Marinade turnip slices in olive oil, salt, and lemon juice until very pliable. Take the filling and place a small dollop of it inside a piece of "pasta" and fold the pasta over to form a rawvioli! Keep doing this until either the turnip or filling is all gone. Serve this as is, or top with pesto or marinara sauce. Enjoy!! I'm hungry for it now that I've typed of the recipe. Yum!!! Really, just experiment and keep tasting until it tastes divine to you! mmm...they do look like pierogies. They just look soooo delicious. Thanks for posting this and for your video on turnips. Sometimes when we make nut dip there is some left over. 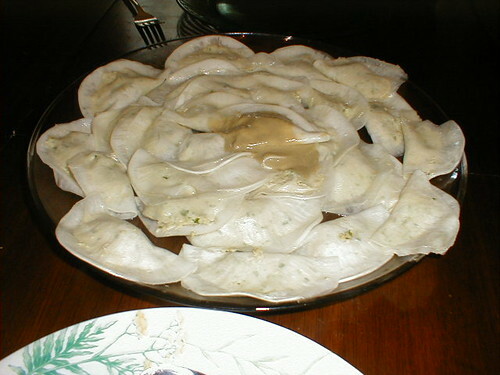 Whenever we make pierogies or rawviolis, using the same nut dip, we somehow finish it all!